I have a new (to me) set of Hersey I speakers. I played them with my Mac 6500 at my office and they sounded fine. 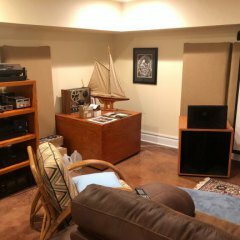 I brought them home and hooked them up to the Marantz 2330 B, and the problem began. The bass is out of control. I had to turn the bass dial almost all the way to the left. The Marantz amp is factory from the 70's, all original caps. My question is what would cause this? I had the Marantz hooked up to a set of klipsch horns and they sounded ok. No real excess bass. Not the case now. Any ideas???? Are you sure the mids and tweets are playing? When I had my Marantz 2252B(52w/ch), it unnaturally boosted the bass in my Heresys and had to turn the dial to about 10:00. Maybe these 70's Marantz receivers are designed that way. Maybe your office has more "bass traps" than the room in your home. Is the loudness feature off? Speakers too close to the wall? Room loading issue? I have yet to hear a vintage original receiver produce more bass than it should unless the bass is turned up or the loudness is engaged. The K-Horns sounding ok is the kicker here.... Make sure the loudness is off and turn the tone controls off as well. I see there is Dolby for FM. Is that in the mix of possible causes? Ugh....OK the loudness button was on. That fixed to bass issue. Thanks for all the help. BUT I lost the right side on both speaker 1 & 2. WTH?? I kept playing with the loudness button. Pressing it in and out again and again. The right side came back but then lost it again. The volume pot needs to be cleaned, there is a lot of cracking when you adjust the volume. I left the unit off for an hour. When I turned it back on, the right side was back. Any ideas? I wouldn't cut your teeth on a 2330B! Not a good plan. It is a combination of issues, I am quite sure. The main in jacks on the back get dirty. The speaker relays get dirty (power cycle brings it back, or crank it up to get it on are the symptoms associated with a dirty relay typically). The controls get dirty. Yes! Deoxit! 2330B is one of my absolute favorites. Definitely give that shot. There are a lot of switches and buttons that need to be cleaned over time. Even then that only proved to be a temporary solution. My Sony & Realistic had the same symptoms as the OP described and got to a point no amount of deoxit would prevent one channel from cutting out immediately. That's a hardware issue. Got the Sony back from a full restoration and it's singing beautifully. Not one hiccup.